I changed classrooms this year, and I’m still putting things away and decorating, but here’s a peek. This image shows my desk in the corner. You can see part of my SMART Board, my Macbeth on one page poster, my diploma, and a Harry Potter poster one of my students gave me last year. The view out that window looks over our baseball field and the student parking lot. In this view, you can see one of my doors (I have two), my SMART Board, many of my student desks, my Romeo and Juliet and Midsummer Night’s Dream on one page posters, my Madama Butterfly poster, and across the hall, my friend and co-English teacher Corinne’s open door. Here is my desk. 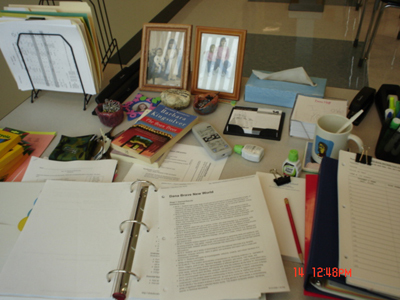 I have my UbD unit plan for Brave New World ready as well as my teaching copies of that novel and The Bean Trees. My room has a sort of odd shape due to its proximity to a stairwell, and I have a large space in the back with a small seminar setup and lots of bookshelves, but the pictures didn’t come out as well, so I’ll have to take others and post later. I think your classroom looks great! I'm very interested in your Macbeth and Romeo and Juliet posters. Did you make them or buy them? Does "Shakespeare-on-one-page" poster literally mean the whole text of the entire play in small print, or something else? And either way, what company did you get them through? Jami and PP, I think I can answer both questions in one go. I didn't make the posters. I first saw them (actually, I think the one I saw was Hamlet) at my local Borders bookstore, and the URL for the company that made the poster was on the bottom of the poster, so I wrote it down. You can order many different Shakespeare plays through their company, which is One Page Books. I actually ordered mine through Amazon, and I think they might have been a bit cheaper. I think they were less than $25 a piece without framing or lamination or anything like that. The entire text of the play is indeed on the page. The print is small, but not too small to read if you stand close. Everyone who has seen them has remarked on them. They are pretty cool. I picked out three plays I knew I would be teaching so my students can check them out. What a nice amount of space you have! I really like your student desks. I haven't seen tables/chairs like this—what a great way to have some flexibility. I am always so envious of classrooms with windows. My school has none. Some days I enter the school in the dark and leave it in the dark. Dreary. Your room looks nice! I was also impressed by your student desk/chairs… very modern looking. Is your Smart Board permanently mounted on your white board? Do you like it that way, if so? Melissa, the desks are pretty nice because they can easily be moved together and fit together really well for group work. I like it that the chairs are separate. 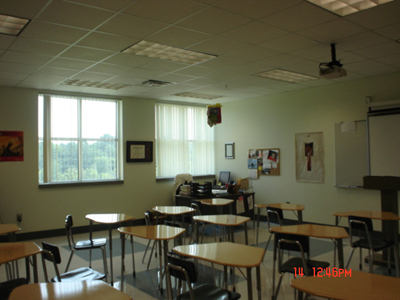 The SMART Board is indeed mounted over my white board, and I would prefer it wasn't so, but when the projectors were installed in the school, for some reason all of them, even in rooms with SMART Boards, were installed pointing at white boards. 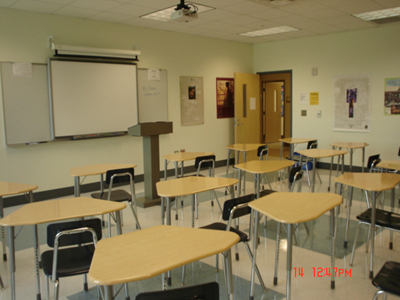 I also happened to have changed rooms and brought the SMART Board over with me, and even if the SMART Board rooms had their projectors pointed a different direction, I'd still likely have the same problem. Essentially, it means I have to use the SMART Board or I don't have a board.